Ewan McGregor's new adaptation of Philip Roth's Pulitzer Prize-winning novel American Pastoral is a noble failure. The screenplay has a complicated structure which keeps Nathan Zuckerman (Roth's alter ego) two steps removed from his subject Seymour Levov (aka "Swede"). Thus reduced in the screenplay to a framing device, the Nathan Zuckerman character is unable to provide adequate context for a story which appears to run in real time from Swede's point of view. In the end, American Pastoral utterly fails to convey who is telling us what, therefore both the "inside story" that Swede should be telling and the "outside story" that Nathan should be telling fall flat. Philip Roth published his novel American Pastoral in 1997, and it won the Pulitzer Prize for Fiction in 1998. I'm not quite sure exactly when I read it, but suffice it to say it was long before I had any clue that I would one day grow up to become a film critic. So this puts me in a somewhat unique position relative to my own self-imposed rules as a film critic. I know I read the source book, and I know I loved it when I read it. But I read it so long ago that I don't really remember why I loved it, much less any details of plot and character. Bottom Line: I did not come to Ewan McGregor's new adaptation of American Pastoral as quite the "blank slate" I always try to be, but that said, I had no specific assumptions beyond the certain knowledge that I wanted to love it. I didn't. Like most of Roth's best work, American Pastoral is set in and around the Newark, New Jersey shtetl in which we were both born. (No, really! In The Plot against America, Roth locates his young self on Wainwright Street between Chancellor Ave & Lyons Ave... which is exactly where I lived until age 9!) It is part of a series of novels about Roth's alter ego Nathan Zuckerman (who, according to Roth, lived on Lehigh Ave, where my cousins lived). It was known as the "Weequahic Section" of Newark because it was anchored by Weequahic High School. Weequahic High was on Chancellor Ave right next to Chancellor Elementary School, the school I went to before my family moved to Livingston (the same suburb where Neil meets Brenda in Goodbye, Columbus). This world, once so familiar to Roth (and to me) disappeared decades ago, and it has been a very long time since either of us lived there. But Nathan Zuckerman (played in the film by David Strathairn) ventures back to Newark for his 45th reunion at Weequahic High, and this is where he runs into his buddy "Jerry Levov" (Rupert Evans). Jerry was the younger brother of "Seymour Levov" (Ewan McGregor), one of the best loved alums in the history of Weequahic High. And yet, things did not turned out as planned, and the plot of American Pastoral revolves around the life of Seymour Levov, first his glorious rise, and then his cataclysmic fall from grace. Even without remembering any of the details of Roth's novel, I know for sure that the "outside story" Nathan should be telling starts with the childhood of a Jewish boy from Newark who is exceptionally blond and athletic. His physicality makes him such an anomaly in his close-knit community that the birth name "Seymour" soon gives way to the nickname "Swede." Roth's irony is intentional. Swede comes of age in America at the very same time that the Nazis are imposing their "Final Solution" on the Jews of Europe, something they justify as "natural" based on their need to preserve the "purity" of their Aryan bloodlines. So how to deal with the fact that Swede looks more like their kind than his own? Do the Jews of Newark love him in spite of this or because of this? No doubt a bit of both. Then the icing on the cake: Swede--the hometown hero--graduates from Weequahic High and becomes a United States Marine just in time to participate in the triumphant finale to World War II. Yowza! But McGregor makes two huge mistakes in his role as a director. First, he thinks it's enough to show newsreel footage of monumental historical events, as if we all know what we are seeing and we all agree on the meaning of what we see. I don't think I heard the word "Holocaust" once, in fact, I think I barely even heard the word "Jew." And so, by the time we get to 1967--when Swede is a bit player in the Newark Riots--the painful tension that should be there between the Jewish characters and the African American characters is chillingly absent. These riots--which brought all Jewish life in Newark to an abrupt end--are just used as a plot point, and then they are over... and then all of the African American characters simply vanish from the screen. Even so, McGregor's second huge mistake as a director was casting himself as Swede. McGregor is a wonderful actor and I have treasured his contributions to a great many films most especially Big Fish (2003), Young Adam (2003), Miss Potter (2006), Beginners (2010), and Salmon Fishing in the Yemen (2011). But McGregor has never had the commanding physical presence required to play Swede. Even in his most well-known "action figure role" (as a member of the Star Wars cast), McGregor played young Obi-Wan Kenobi, in other words the most cerebral guy onscreen. Since he is never remotely believable as Swede-the-Jewish-Ubermensch, McGregor is never able to draw us into the "inside story" that Swede should be telling about how this man of such great promise literally had his heart torn asunder by the contradictory pressures of the 60s. To be a good father, to be a good son, to be a good husband, to be a good boss, to be a good neighbor, to be--in sum--a mensch in the Jewish sense (regardless of whether or not he lived as a practicing Jew), it is all too much for Swede. Someone who never failed as a youth succumbs to utter failure as a man, but the Swede on screen lacks the gravitas Zuckerman needs him to have in order to make sense of why he is personally so affected by Swede's passing. The only actor able to transcend this mess is Dakota Fanning who plays Swede's daughter Meredith (aka Merry). Miserable from the start, Merry channels her rage into revolutionary action, determined to change the world because she cannot change herself. Alas, this makes her arc not just poignant but timely. How many young people today take up causes they will one day come to regret? (I am reminded of the superlative documentary Killing Kasztner in which Ze'ev Eckstein tells filmmaker Gaylen Ross on camera how he came to be involved in the plot to assassinate Rezso Kasztner in 1957, and how much his actions back then haunt him now). Even though both her director and her screenwriter hobbled her, Fanning still succeeded in winning my respect and breaking my heart anyway. Since Merry is the character closest in age to my own, I feel sure I would have smelled a rat if anything about Merry had been off. Quite the contrary, Fanning dominates every moment she is present onscreen, and when she is not on screen, her absence left a void for me as well as for Swede. Are all Philip Roth adaptations doomed? This is the second adaptation of a Philip Roth novel to reach the screen in 2016. The first one, a few months back, was Indignation. Most of my colleagues on Rotten Tomatoes wrote somewhat kinder reviews, but then most of the reviews posted on RT are written by guys. I did not like Indignation and I did not recommend it. One way or the other, Indignation was a commercial flop. So it this just another case of the old cliché a source book is always better than its screen adaptation? I do not believe that old cliché, and, in fact, every time I argue against it, one of my favorite examples is The Human Stain, a film by Robert Benton that is much better than the Nathan Zuckerman novel on which it is based. The critics who posted on RT when it was released were very hard on The Human Stain, and it was also a commercial flop. Nevertheless, I suspect it plays much better now that Anthony Hopkins and Nicole Kidman are no longer the big stars they were way back in 2003. I am also very fond of Isabel Coixet's film Elegy (based on Roth's David Kepesh novels), which was much better received by critics, but still not the success with audiences that I think it should have been. Here is my capsule review of The Human Stain with comments on two earlier adaptations (Goodbye, Columbus and Portnoy's Complaint). And here is my full review of Elegy, with extensive comments about the transition from page to screen. And here is Eliana Levenson's review of Indignation with my own "Two Cents" added at the bottom. Top Photo: Ewan McGregor as "Swede Levov." Middle Photo: Dakota Fanning as Swede's daughter "Merry" at the start of her rebellious teenager phase. Bottom Photo: Peace in the Levov home is destroyed when Swede, his wife "Dawn" (Jennifer Connolly), and their young daughter Meredith (Ocean James) watch the news from Vietnam on television. 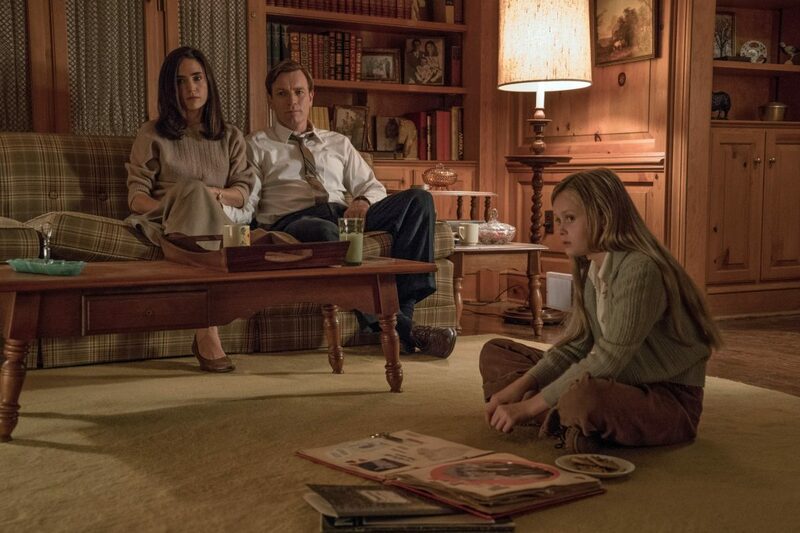 Q1: Does American Pastoral pass the Bechdel-Wallace Test? Ewan McGregor cast several wonderful actresses in key roles, then gave each of them one big scene with Swede. None of them interact with one another, not even Dakota Fanning and Jennifer Connelly (who plays her mother Dawn-the-Shiksa-Goddess). Connelly has one terrific scene in which she screams at Swede, telling him what she thought she wanted out of life before she met him. Of course that simple life she says she craved was never to be. A woman as beautiful as Dawn would never have been left in peace by all the men who lust after her. Nevertheless, it was Swede's fate to win the princess only to lose the kingdom. Uzo Aduba (as Swede's glove factory employee "Vicky"), Valorie Curry (as Merry's comrade-in-arms "Rita Cohen"), and Samantha Mathis (as the widow of "Russ Hamlin" the man Merry kills when she bombs the post office) each get their big moments too, but otherwise none of them have substantive characters to play. Furthermore, although they may serve the plot as written, these three scenes are all cinematic disasters. Each one is so strong that it stops the show for a moment, but rather than build to a climax, American Pastoralkeeps sputtering along on screen until it dies of exhaustion. Molly Parker also has a couple of brief scenes as Merry's therapist "Sheila Smith," but they left me scratching my head. My gut tells me Dr. Smith is a fairly significant player in Roth's narrative. In the screenplay, however, too much about her role is left unsaid. I suspect part of the fault for the perfunctory feel of these women characters lies with Philip Roth. Long after he is gone, feminist scholars will likely still be debating whether or not Roth was a misogynist. But once the screenwriter and the director begin collaborating on an adaptation of one of Roth's novels, they should either commit to doing better or trim accordingly. Q2: Where is the Weequahic Section of Newark? This entry was posted in Films/DVDs and tagged 1998 Pulitzer Prize for Fiction, American Pastoral, American Pastoral (2016), Dakota Fanning, David Strathairn, Elegy (2008), Ewan McGregor, FF2 Media, Indignation (2016), Jan Lisa Huttner, Jennifer Connelly, Jennifer Connolly, John Romano, Killing Kasztner, Molly Parker, Ocean James, Philip Roth, Rupert Evans, Samantha Mathis, The Human Stain, Uzo Aduba, Valorie Curry, Weequahic High School, Weequahic Section Newark NJ. Bookmark the permalink.